What types of storage sheds are available? According to statistics, 7 out of 10 people don’t have enough storage space in their home. It’s due to our consumerism mentality, as we like to keep everything we own. Now if you’re like most people then you’ll have cupboards or wardrobes filled with excess toys, linen and other random items. You’ll be struggling for space and contemplating moving home or throwing out items just so your house can look tidy again. It’s never been easier to store excess items you’ve got laying around the home. Cheap Sheds has come to the rescue with affordable and reliable outdoor storage solutions. Our range of storage sheds come in all shapes, sizes and colours so you’ll be able to find one that suits your taste and better yet your budget. Now before you rush off and buy a shed there are a few things you need to know. Which design is right for my needs? Let’s look at these important points in a bit more detail so you can make an informed decision. That way you end up with a shed you want. All three types are great quality but they all have different features and are best suited to different conditions. Lets take a look at them in detail. The zinc sheds you’ll find on our site are made using High Tensile Steel. It’s the most durable and reliable material you can use for your shed. The best part about the Zinc sheds range is they are made right here in Australia. Due to Australia being the largest producer of Iron Ore in the world, shed manufacturers here in Australia have access to the finest quality metals available today. And for you, that’s exactly what you want. The sheds you can buy from overseas are made from inferior and low quality metals. If you live here in Australia, you don’t want a shed that’s made using cheap metals, as it won’t be able to withstand the Aussie Climate. 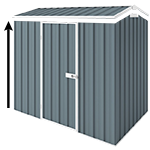 Our main suppliers (Absco, Spanbilt and Durabuilt) use only the finest quality Australian metals when making sheds, garages and carports. The zinc sheds are also available in colour (up to 25 different colours on some of the range). The paint is burnt on so that it won’t fade or peel under the Australian Sun! This is also known as Colour Steel or Colorbond. So if you want to solve your storage problems and buy a tough, low maintenance and stylish garden shed that will withstand any climate conditions... look no further than our range of Zinc Garden Sheds. They also come with up to 20 year’s warranty. 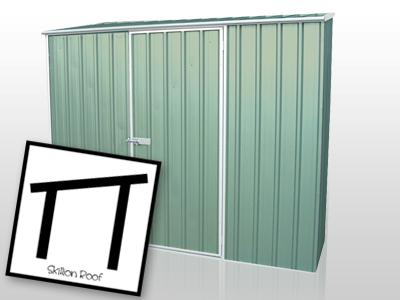 Also available in our storage sheds range is some of the finest quality plastic and wood sheds. As Cheap Sheds are a supplier of high quality and affordable storage solutions, we only sell the best! But the best doesn’t mean the most expensive. Our Plastic Sheds, which are manufactured in the USA and Israel, meet our high quality standards. They are made using only the best materials and are available in different shapes and sizes. Although not as big as the steel sheds, they are still a great compact storage solution for all the loose items you’ve got laying around the home. 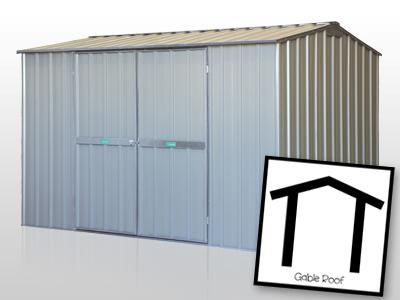 Check out the range of plastic sheds here. For those of you, who want a storage solution with style, look no further than the Wood Shed range. Made in Australia using the finest materials, these sheds will add style and value to your home as well as providing a place to store excess items or maybe even to have a workshop. They do require more maintenance but if you want a stylish ‘mountain retreat’ style shed in your backyard, look no further than the range of wooden sheds here at Cheap Sheds. So far we’ve looked at Materials and also discussed the benefits of buying Aussie made. Now let’s look at Design and Warranty. Actually after all, if you don’t need 4 walls with your shed, you can even get one with 3 walls. Some of our slim line storage sheds are designed to be placed against a wall and come without rear wall. So there you go. As previously mentioned there are up to 25 different colours available on selected sheds. Two coats of paint are burnt on so that it won’t fade or peel in the sun. You can add a skylight or window in your shed which will add more natural light and provide fresh air and ventilation. You can also add another door to make access easier. The products available from Cheap Sheds come with up to 20 year’s warranty. Unlike overseas purchased items which you have to send back to the country you bought it from... In the unlikely event you ever have a warranty or servicing claim with a product you’ve purchased from us, it will be dealt with right here in Australia. So there you have it... Everything you need to know about solving your storage problems. Like most people you’ll have some questions regarding the purchasing of your own shed. If you want to know about delivery just click here. If you’d like to see just how easy it is to assemble your own garden shed, check out the assembly videos here. For all other questions please contact our friendly and super helpful customer support team via email, phone or live chat. We look forward to helping you solve your storage problems and bringing some cleanliness back into your life.